Between a sheath and ball gown, A-Line dress has a fitted bodice and skirt that flares out to an A shape. It is a very balancing style that suits most figures. It will particularly flatter a neat hourglass shaped woman. If you have a pear-shaped (triangle) body, try having some pleating at the front and back of the skirt. With simple alterations, it can make you look slimmer or taller than you actually are. This wedding dress has a boned bodice and full skirt. It will be helpful for bottom-heavy figures to disguise the full hips. This style also provides a more proportionate look for brides who are voluptuous. The voluminous skirt may not be very practical for your AD. Nonetheless you will look like a princess in it. Kim garbed VW and Joanna Garcia in a #sweetheart strapless Monique Lhuillier ballgown. The mermaid wedding gown fits the body and flares out below the knee. This style accentuates the body of a curvaceous hourglass-shaped bride. It doesn't flatter short figures though. The dress is tight at the knees making it cumbersome to walk. Coco Lee with her neat hourglass body shape looked elegant in the pearl-embellished WG designed by Vera Wang. 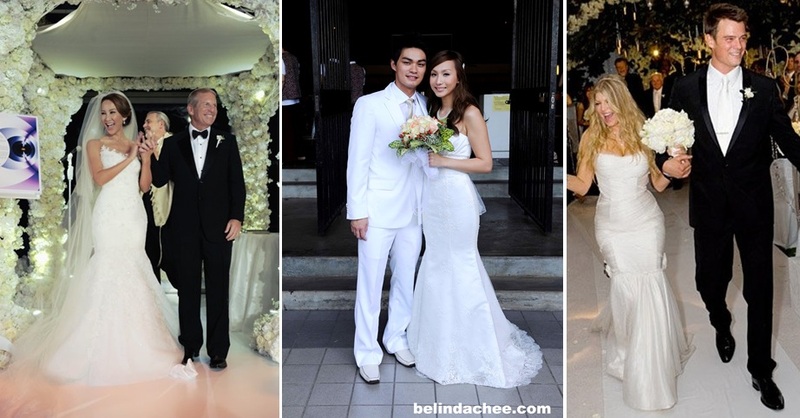 Belinda Chee wore an #Empire cut Mermaid dress with short train and scalloped lace ending made by Carven Ong. Fergie's dress was custom-made by Dolce & Gabbana. The mermaid dress shows off her fuuulll hourglass bod. The empire cut wedding gown is high waist. The skirt begins just under the bust-line and flares down loosely. It is recommended for brides with smaller bust, thicker waist and hips, and short legs. The wedding gown is able to accentuate the bust and at the same time hide the bottom part. It is not recommended for full hourglass figures. 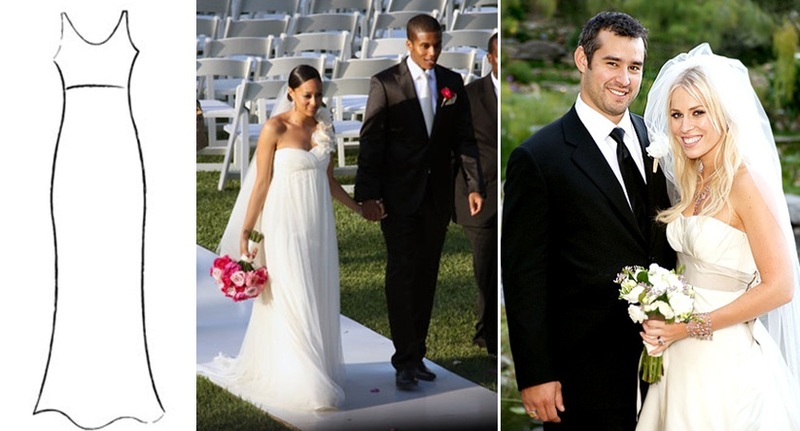 Tia in Kevan Hall and Natasha wore a Vera Wang. This cut is simple, straight and has darts that skims the body. It is not recommended for full hourglass or pear shaped women as it will make them look heavier. If you have a slim figure, this dress is perfect for you. Kate Moss was hitched in a sheath dress created by her friend John Galliano. The V-neck, lace-embellished back, sheath wedding dress worn by Bella Swan (Kristen Stewart) in "Twilight - Breaking Dawn Part 1" was made by Carolina Herrera. Cette coupe est simple, direct et a fléchettes qui rase le corps. Il n'est pas recommandé de sablier pleine poire ou en forme de femmes, car il leur donner un aspect plus lourd. Si vous avez une silhouette mince, cette robe est parfaite maillot de bains.